Often in November, Facebook blooms with “I am thankful for” daily posts. I decided to do one this year, but wanted to avoid the typical entries. So I have been thankful for being born in this time, living in upstate New York, being able to write, my cats, my mother’s example, and having a life with challenges so I can grow. Today’s was gratitude for a Handy Husband. My guy has the kind of mind that can look at a situation and pull apart the components, patiently working with them until he can come up with a solution. Because he thinks like that, and is unafraid of fixes that may not look textbook perfect, he came up with an ingenious way to keep smoke from the wood stove from filling the house. An extra length of stainless steel pipe now rises majestically above the lip of the chimney, wafting the smoke above the treeline and out over the hayfield. 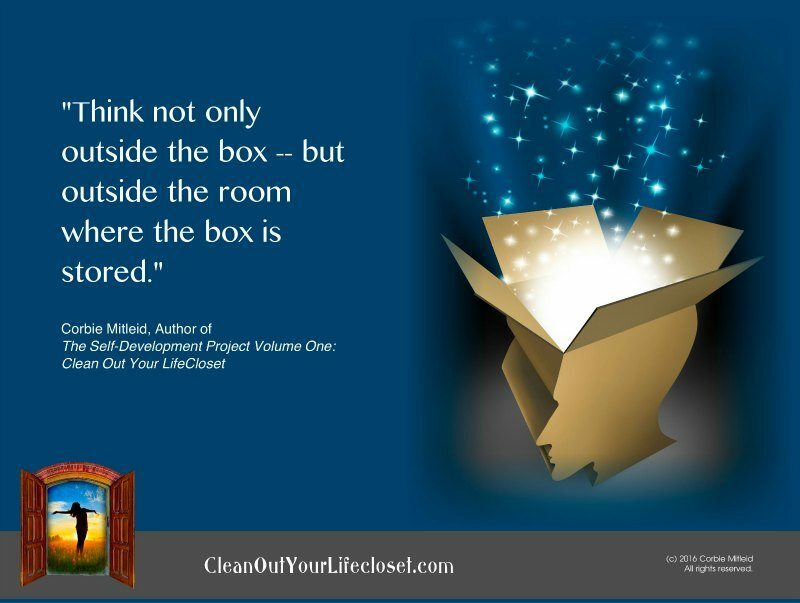 That unique solution is a perfect example of “thinking outside the room where the box is stored.” When typical answers aren’t working, then don’t be afraid to put the parts of a puzzle together in a way that is different from the accepted norm. For several years, a longtime friend of mine lived with a tent, her dog, her kitchen utensils, and a few supplies. She traveled from Massachusetts to Maine to Georgia. She sometimes lived out of her car, and sometimes out of her tent. She discovered that being footloose and fancy-free—without the responsibilities of a home, a mortgage, a job, or a landlord—was where she needed to be at that point in her life. Some people would call her homeless. She never thought that way; instead, she cheerfully referred to herself as “merely unhoused.” She had exactly the life she wanted and felt not one whit sorry for herself. For her, happiness was outside of needing the comfort of having a roof over one’s head. By thinking outside the box and deciding not to live by standardized, conventional rules, my friend found a rare peace and happiness. When she felt the need to settle, she sought aid and is now in a cozy little apartment in Maine. Will she stay? She will, as long as it’s where she feels secure. When roof and walls become too much for her, she will move on. And I say bravo to her for knowing herself so well. When we try to fit our solutions into other people’s expectations, or other people’s idea of what life should look like, we miss so many opportunities to explore, to invent, to be utterly ourselves without apology. So today, I encourage you to “think outside the room where the box is stored.” Take a look at a long-standing situation that can’t seem to settle itself, and see if a completely novel way of playing with the ingredients comes up with a new and inventive recipe for resolution.